At this point, should Facebook Inc. (FB - Get Report) just come out and list all of the things they've done wrong? Seemingly every week a new article or headline is out blasting the company for another privacy issue or misuse of personal data. The media -- as they should -- is uncovering a treasure-trove of poor decisions from Facebook. Should management get ahead of it or just let it play out? I'm glad I don't have to make that decision, but it would likely lead to a faster bottoming in the stock price. At the end of the day, Facebook is here to make money and the company makes plenty of it. But its user base is the product, essentially, and losing users will inevitably hurt business. That's why these news stories -- like the New York Times' piece on how to delete your Facebook account forever -- can be so detrimental to its long-term business. That's even as it has other high-growth platforms like Instagram. The truth is, Facebook will likely find a way to fight through this deluge of negativity. In fact, we're already seeing it hold up to some degree. While Facebook and the Nasdaq are each down about 20% on the quarter, Facebook is faring better than Amazon (AMZN - Get Report) and Netflix (NFLX - Get Report) , which are down 28% and 34%, respectively. Facebook's only doing slightly worse than Alphabet (GOOGL - Get Report) (GOOG - Get Report) , which is down 16.5%. For the month of December, Facebook's 8.5% decline is better than the Nasdaq's 11.5% tumble and it's outperforming all of the FAANG's for the month. So there is some hope. The big question is whether the lows will hold. 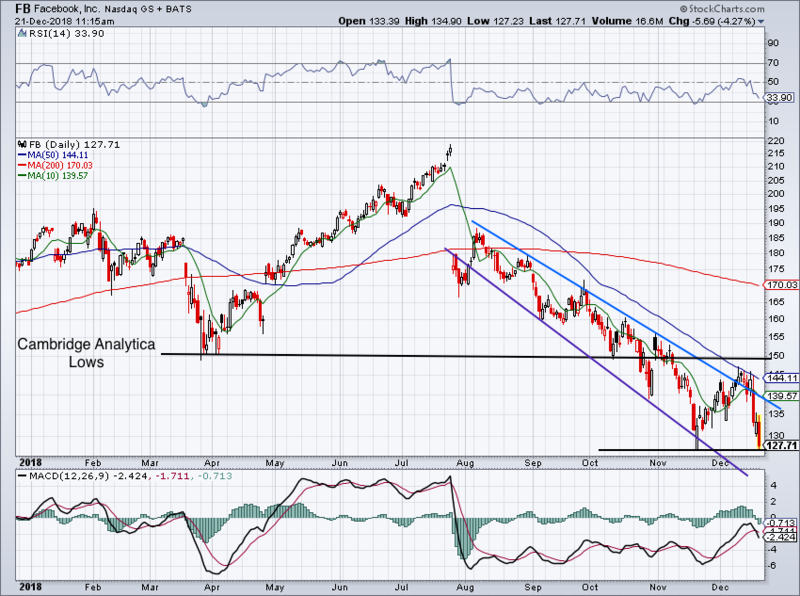 Shares of Facebook tried to breakout over downtrend resistance (blue line) earlier this month. While consolidating north of this level, it looked as if its November plunge down to $126.48 may have been the low. But the 50-day moving average stymied FB's rise, while a rout in the overall market helped to push Facebook back below downtrend resistance. It now rests below all of its major moving averages and is teetering on its lows near $127. Should it lose this level of support, it opens the door to more losses in the future. Below here and the selling could accelerate. Earnings in July crushed the stock, while earnings in October weren't so bad. Maybe its results in January will be enough to lift Facebook out of this hole, but that's still a month or more away. Can investors afford to wait that long? If and when Facebook stock does eventually get back to its bullish ways, look to see how it handles the $150 level, its lows from the Cambridge Analytica scandal. In the meantime, see how it handles current support. A bounce may get us to $135 to $138, but if downtrend resistance kicks back in, we may very well see another test of the lows. If the lows give way, look out.